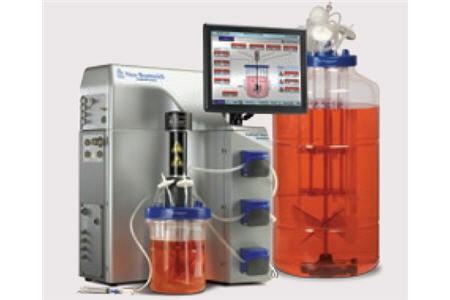 This study illustrates a protocol for the scale up of CHO cells using New Brunswick™ CelliGen BLU stirred-tank bioreactors equipped with 5-Liter (L) and 50-Liter (L) single-use vessels. CelliGen BLU is a versatile benchtop system for the culture of a variety of cell lines. This bioreactor has been designed to provide research and production facilities with single-use vessels that combine the benefits of both traditional stirred-tank design and single-use technology, capable of seamless process scaleup. Eppendorf has recently launched the CelliGen BLU 50 L system to address larger volume batch demands.